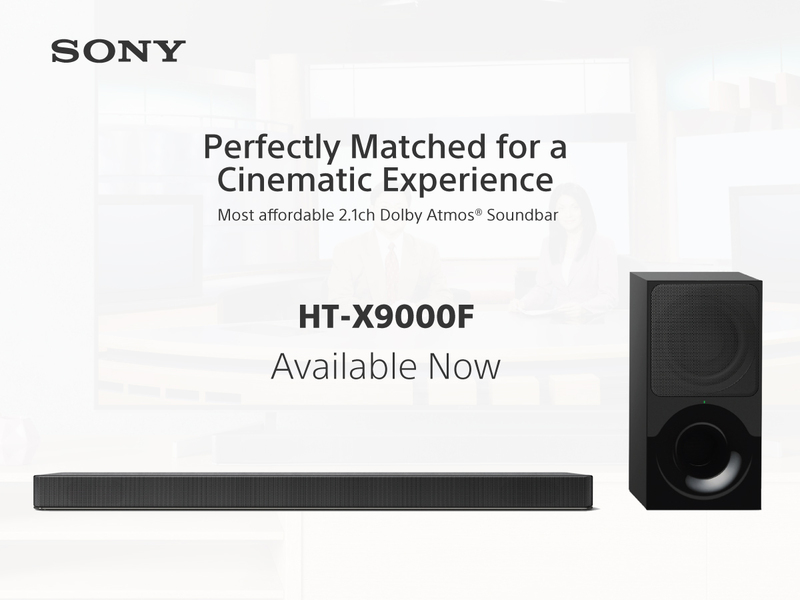 Additionally, the HT-X9000F soundbar, Sony’s most affordable Dolby Atmos soundbar, is offered in a different design concept that matches the distinctive design of Sony BRAVIA True 4K TVs. The 2.1ch bar brings cinematic surround sound features of Dolby Atmos/DTS:X and Vertical Surround Engine. The HT-X9000F embraces the sophistication of Sony BRAVIA TVs by enhancing entertainment and blending effortlessly with the comfort of your home with natural texture and slimmer bodies. With Dolby Atmos and DTS:X support, the 3.1ch soundbar HT-Z9F is capable of totally immersing its audience with three-dimensional sound in its compact, yet proficient size. Measuring a sleek 100 cm × 6.4 cm × 9.9 cm (3,1 kg) for the bar speaker and a discreet 19 cm x 38.2 cm x 38.6 cm (8.1 kg) for the subwoofer, the HT-Z9F will fit nicely into any chosen home décor. With Sony Vertical Surround Engine technology in the HT-Z9F soundbar, audiences will get a sense of helicopters whizzing above and car chase action around you. Combined with the S-Force PRO Front Surround technology that improves the existing surround sound now recreates the feeling of being surrounded by speakers for a true home theatre environment. 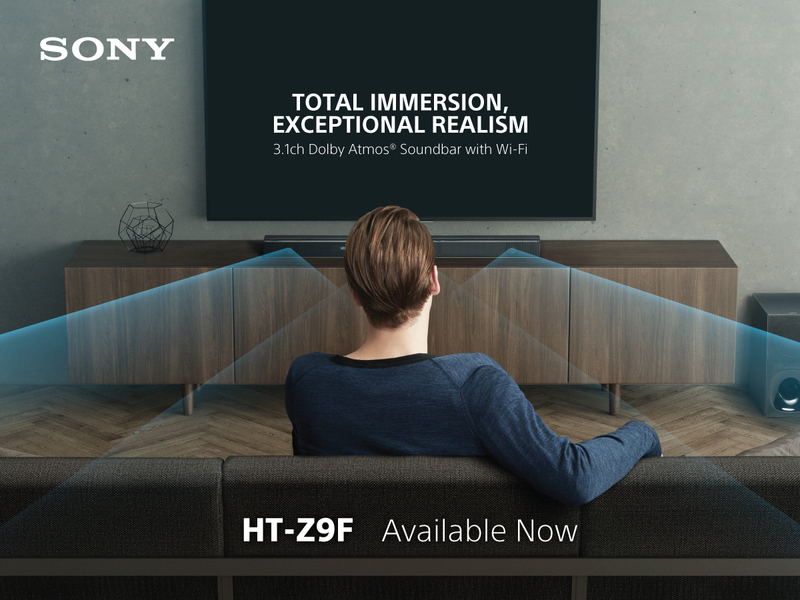 Even without Dolby Atmos and DTS:X content, virtual three-dimensional sound is enjoyed thanks to“Vertical S.” button on the remote that pushes the HT-Z9F to up mix 2ch stereo content up to 7.1.2ch. The HT-Z9F and HT-X9000F supports 4K HDR and Dolby Vision™ so that the original picture quality is passed through the bar directly to the TV without any loss of quality, resulting in great colour clarity and brightness. The HT-Z9F supports high-resolution audio formats which brings your favourite music files into life through the pin sharp clarity of the DSEE HX™ (digital sound enhancement engine feature). Both soundbars are designed to match a selection of the new Sony BRAVIA® TVs’ aesthetic for an elegant set-up. The soundbars’ shape fits perfectly between the base of a Sony BRAVIA TV. Additionally, the HT-X9000F has the edges chamfered off at an angle to fit against the legs of a Sony TV stand, and specifically matches the design of the Sony X9000F Bravia series. Ideal for minimalist interiors, the slim design blends seamlessly into any living space. A minimalistic look can be achieved with the two soundbars which gives the option to go cable-free via Bluetooth® connectivity. The Z9F also has Wi-Fi connectivity for access to music service from the Chromecast built-in. A refreshed and intuitive user interface makes it easier to set up and use with Sony TVs. With up to 2 HDMI input and 1 output connectivity, multiple devices can be connected to the soundbar. Both models also have USB connectivity in addition to Bluetooth® technology. Sony’s unique Vertical Surround Engine technology makes it possible to reproduce “vertical” sound without needing ceiling speakers nor Dolby Atmos Enabled Speakers. The 3.1 channel speaker of HT-Z9F means that it has no upward-firing speakers that create illusion of height using digital signal processing alone. It is no longer dependent on a room’s environment. This unique surround sound technology allows HT-Z9F and HT-X9000F to give the Atmos/DTS:X experience with a thin profile without using Dolby Atmos Enabled Speakers and rear speakers, letting you enjoy sound from all directions with 7.1.2 surround sound. Sony’s unique vertical surround engine claims that they can replicate the wide soundstage Atmos provides. The HT-Z9F and HT-X9000F will be available in the Philippines starting May 24, 2018. Price starts at SRP 42,299 for HT-Z9F and SRP 31,199 for HT-X9000F.